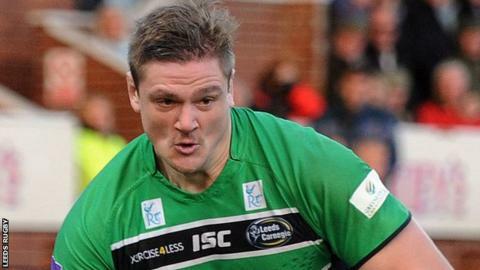 Newcastle Falcons have agreed a deal to take Leeds lock Calum Green to Kingston Park for the 2014-15 season. England Under-20 international Green, 23, began his career with Premiership side Leicester Tigers, for whom he made 19 first-team appearances. He joined Leeds in 2012 and helped the club to the Championship play-offs, in which they lost to the Falcons in 2013. "I'm delighted he has made the decision to move to Newcastle," said Falcons director of rugby Dean Richards. "Calum has already shown that he is more than capable of performing in the Premiership during his time with Leicester." Green will link up with former team-mate Dom Barrow, who joined the Falcons from Leeds last summer.